Canastos is one of these few book test predictions, which you can perform anytime, anywhere and with anyone. 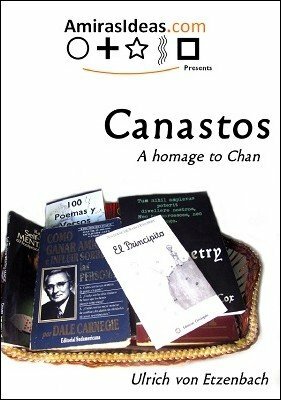 Once you have learned Canastos , you can perform an impromptu miracle wherever you go. The performer invites a spectator to take part in his experiment. The performer hands a spectator an envelope and asks them to make sure it is never touched by the performer again. The spectator is also given a book to inspect and to make sure that every page is different with nothing else written down except the text itself. The performer takes the book back and riffles through the pages until the spectator calls out stop. The performer stops on the exact page that's called.The performer estimates the number of lines there are on the page and asks the spectator to choose one of the numbers, say between 1-45. The spectator then counts down to his chosen number and chooses any word from the line he is now on. Once this is done, the envelope is finally opened and inside there is one piece of paper. Unbelievably the word written on the paper matches 100% correctly that chosen by the spectator!